Read below to find out what a Restorative Approach is, and why we use it in our school. Restorative Approaches looks at the harm caused after a negative incident, rather than the punishment needed. All Restorative practices look at the positive relationships between individuals and how to repair them in light of any negative events which may occur. Restorative Approaches give each person who has been involved in an incident an equal opportunity to have their views heard and subsequent needs met. All members of staff use the same questions with each child and incident so the process is systematic and fair. Through the use of Restorative Approaches we acknowledge that each person has their personal point of view, or unique perspective and personal response to incidents which they may have been involved in. We also understand that thoughts and feelings drive our actions and therefore must be discussed and dealt with in order to prevent the same incidents from reoccurring. Restorative Approaches teach children to think about the harm caused by their behaviour and the impact this may have on others. Finally, all persons involved in negative incidents have the opportunity to put things right in a way that they deem reasonable. At St. Thomas’ CE Primary School we believe that when negative incidents occur the best way to put them right is to learn from our mistakes, and work together to find a positive solution. By using the restorative approaches staff are able to fairly and consistently investigate what has happened in order to see things from everybody’s point of view. 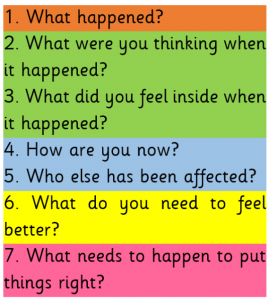 We believe that by following these questions in each incident that we deal with our children will begin to develop the skills which they need to resolve broken relationships for themselves as the process focuses on self reflection and telling the truth rather than appointing blame. When asking these questions staff are spending time to understand the feelings of all children and how they may have led to any negative actions. This helps children to receive the advice and support they may need to prevent further negative incidents. We also believe that our children could be able to, with appropriate training and support resolve negative issues by themselves. This empowers them to think resourcefully and with empathy. All staff members carry these question prompts with their lanyards at all times. The children are familiar with these questions and know how to work together to put things right. 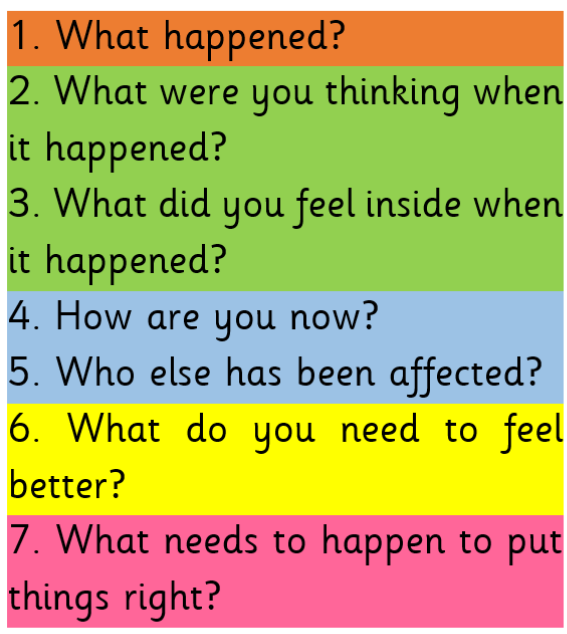 All of our staff have been trained to deliver Restorative Approaches and to use the question prompts as shown. If you would like any further information, or if you have any questions about this approach please contact your child’s teacher who will be happy to talk you about Restorative Approaches. As the end of the academic year quickly approaches, it is time for our fantastic champions to pass on the responsibility to a new team. 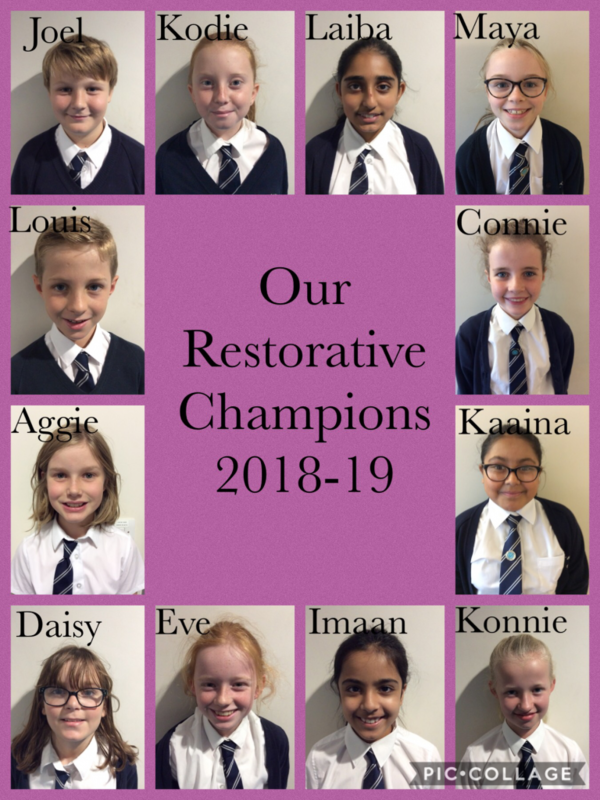 We are very grateful for the time, patience and teamwork that our current Restorative Champions have selflessly provided, with the same expert training our new members can continue this and maintain the positive relationships amongst all of our children.